This is a story about my grandfather who served in the Navy during WWII and something that he helped create during that time period. I have a trip coming up to the National Institute on Genealogical Research this July in Washington, DC and hope to find some clues that might help me find out more about the item while I am there, or possibly even see it. On with the story. Burnell Bybee worked for a company called Morrison-Knudsen during the years of 1939 to 1941. They were a large engineering firm that built things all over the world. He was working building barracks for the US Government on an island in the South Pacific called Wake Island. The government knew that the United States would most likely be at war soon and wanted to protect the South Pacific as much as they could. It got to be very dangerous and he ended up on the last ship of civilians to leave the island. He later learned that all of his friends that stayed were shot by the Japanese down on the beach. 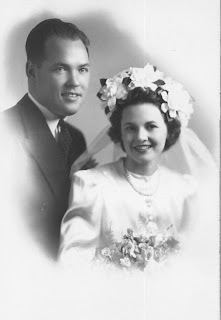 It was that December 5th that he and Gwendolyn Jensen were married and two days later on the 7th of December, Pearl Harbor was bombed. 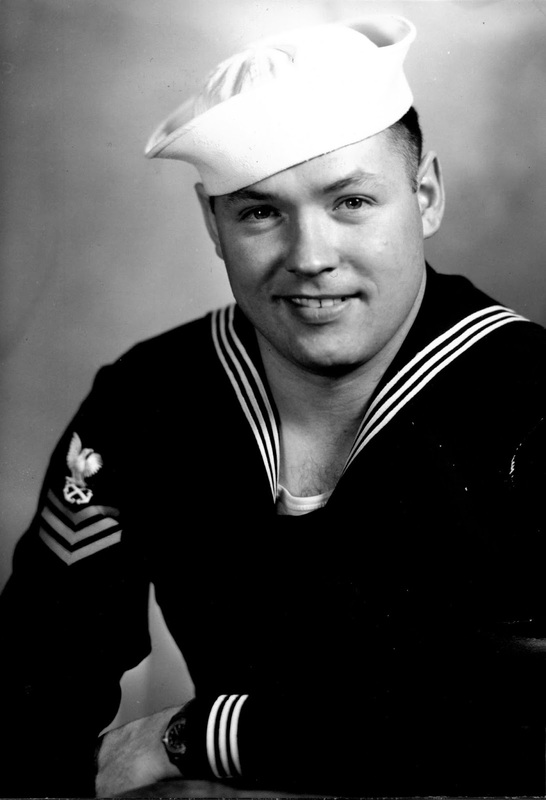 He then decided to join the Navy, along with his two brothers-in-law. He was sent to Farragut Naval Station, which was a training base in Northern Idaho. He was great at swimming, so he taught the new young navy guys how to swim and how to save their own lives, as well as others, if necessary. He was also very good with knots and so taught the sailors how to tie the many knots that are used on ships. He was so good at teaching knots that the US Admiral of the Navy commissioned he and his good friend Carl Lindquist to do a knot board for the Navy Bureau in Washington D.C. as was written on the back of the picture given to me by my grandmother. Below is a picture of the knot board (click on it to see a larger view). I have always found it very fascinating, but have no idea where it might have ended up. 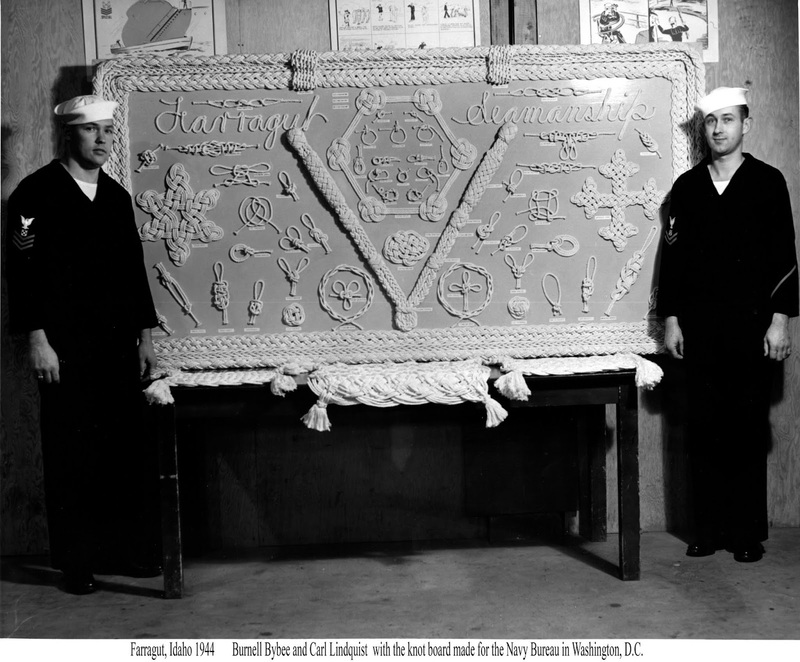 I am told that there is a very similar one hanging in the Farragut Naval Station Museum (http://museum.mil.idaho.gov/farragut.html), but that it doesn't appear to be as big as this one. I would love to find someone that might tell me if they know anything more about it, where it might be, or who I might contact to find out more. Any help anyone can give me would be much appreciated! !